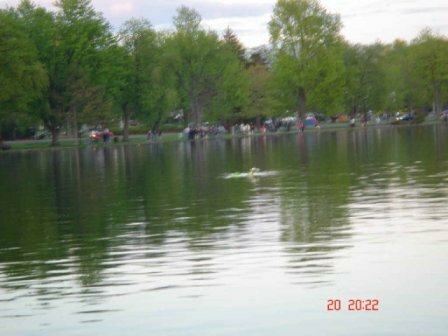 The organizing committee for the 2005 Ottawa Flotilla asked the Rideau Nautical Modellers to make a sea-serpent, similar to the Loch Ness Monster, surface at several locations around Dow's lake. 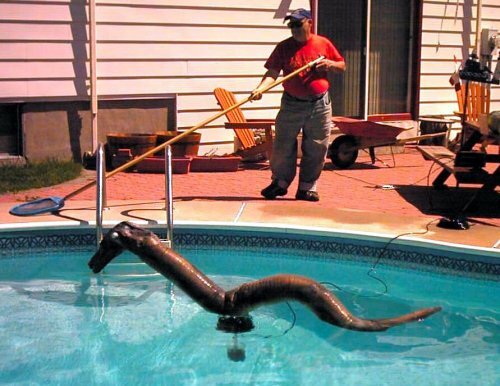 This could be accomplished by building four serpents or "Dowsys", and having them surface and dive sequentially at different locations, at five minute intervals. It was decided to keep things simple by sequentially pumping air from four small air compressors on shore, through quarter-inch vinyl tubes into the buckets of submerged Dowsys (see drawing below). The vinyl air tubes were kept submerged by weights placed along their lengths. After each Dowsy surfaced, its compressor was turned off with a timer and air slowly leaked from small holes in the bucket until the Dowsy sank, finally lying flat on the lake bottom out of the way of boat propellers. The weight keeps the entire unit vertical. 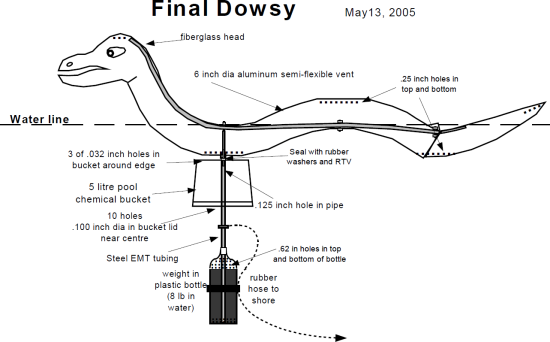 Each Dowsy was made from 6 inch diameter aluminum semi-flexible vent tube, strengthened with fiberglass. The head was hand-made from fiberglass over a styrofoam form. 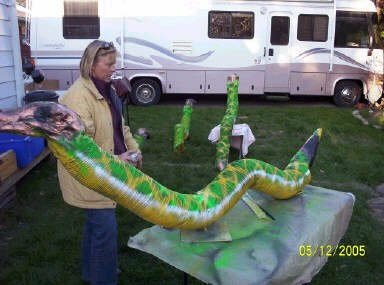 Each Dowsy was 6 feet long with an 18 inch fiberglass tail. A metal tube inside the Dowsy body strengthened the assembly. The following photo shows painting of the final four Dowsys.